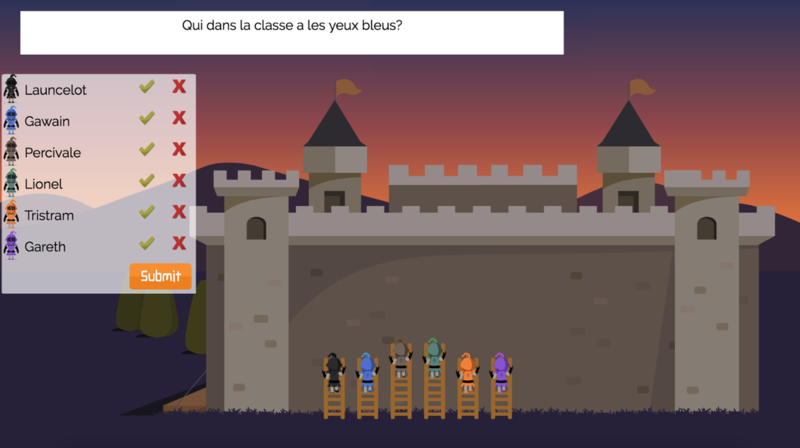 In this medieval race game, knights build a ladder to be first at the top of the fortress. However, when the drums are heard, no one is safe from the archer's attacks. Select from 3 different fortress sizes for different length of play. A small castle for 10 question games. A medium fort for 15 question games. A large fortress for 20 question games. Build your ladder with every correct answer. When the archer attacks, be sure to answer correctly to keep your ladder intact! Select and play with 10 different knights. Select the number of student teams (up to 10), the game size (10 questions, 15 questions or 20 questions) and to display questions on screen or not*. Select a knight and a name for each team of students. Select correct or incorrect for each team in order for them to start climbing the wall. When an archer appear students will be asked a special question. If they answer correctly, their knight will stay a the same level on the wall. If they answer incorrectly, the archer's arrow will burn a piece of their ladder.